Nothing can be more limiting to the imagination, nothing is quicker to turn on the psyche’s censoring devices and distortions systems, than trying to write truthfully and interestingly about one’s own home town, one’s Episcopalian mother, one’s crippled younger sister. The key is to distance yourself from your personal narratives. Think of how you tell a familiar story. Every time you tell the story, you improve on it – pausing here for laughter – pausing there for drama. Go ahead and use your own stories, but crank them up. Treat your story with the same attention to craft as if you were inventing from scratch. Use and then butcher and embroider the truth. One way of cranking up your story is to find a partner. Tell one of your stories to your partner. He can take brief notes. Then he, in turn, will tell you his story. Using your notes, you will both turn the shared stories into something more. You will be surprised at how interesting your story is when shaped by someone else’s hands. Mention that you are traveling by bus to Mexico and see the eyebrows disappear in the hairline. 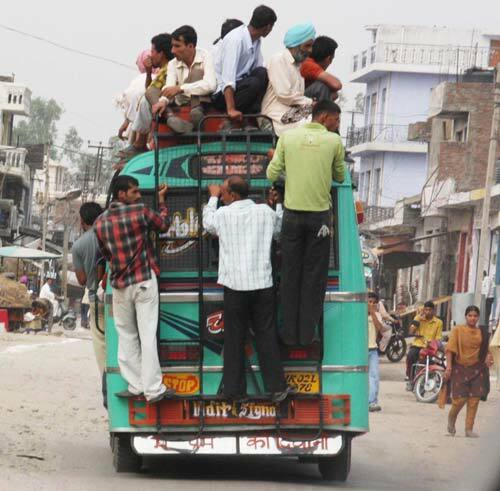 Some of the surprise is probably based on Third World pictures of jabbering people, squawking chickens and bleating goats- overflowing the bus, hanging out of windows and sitting amongst luggage, maize and market vegetables on top of the bus. Another point of concern might be the cartel drug barons who President Felipe Calderon promised to squash with a military-led crackdown. The military is very much in evidence, but with 30,000 thousand deaths in the past four years, Calderon has little to show for his efforts. The cartels are more powerful than ever. Any journalist or official who tries to expose or break the cartels risks his life. As for our travel to Mexico by bus, we love it. 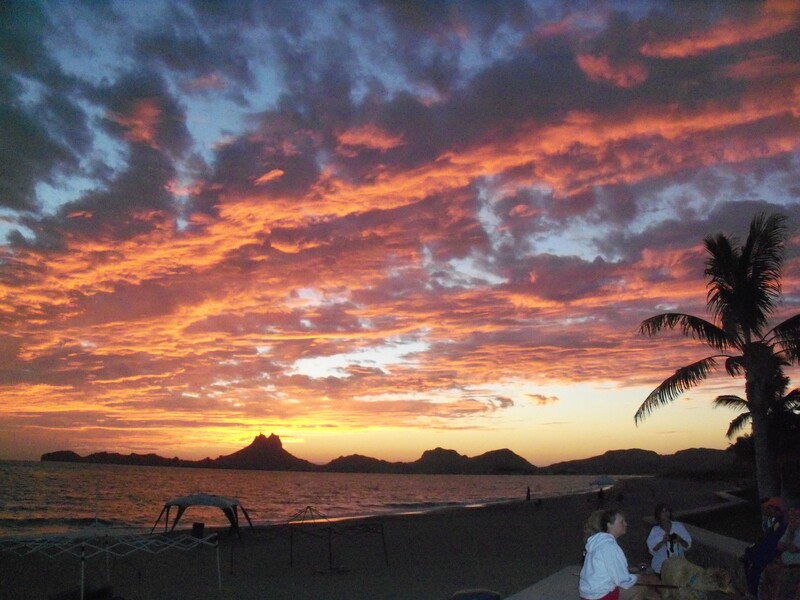 When going to San Carlos/Guaymas on the Sea of Cortez, we travel by TUFESA. The buses are new Volvos. The drivers’ uniforms are pressed and the knife blade creases are sharp enough to slice the upholstery. The seats are better than airline seats. The restrooms are clean, and the passengers are quiet. “Smart casual” is the dress code. Typically, we are the only Americanos on the bus. So far, the exception has been ex-pats who are going or coming from a Veterans’ Hospital in the States. We have never felt unwelcome. Mexicans are generous with their smiles, food, and Bien Viajes. Having taken our first trip without food to share, we have learned to take something: if someone offers us food, we have a treat to give in return. The trip from Tucson to Guaymas is seven hours or three and a half movies. Coming down this most recent trip, we saw something with Eddie Murphy, Taken, Alice & Wonderland, and Harry Potter and the Half-Blood Prince. Not too shabby. As for San Carlos, the town is pretty sleepy. Wal-Mart and Sams’ have just come to Guaymas and occasionally a cruise ship comes into port, but San Carlos has a new restaurant or two – not much more. Tourism is down. Last night we went to hear The Really Bad Blues Band from Tucson. (Check them out on-line – good musicians.) They were playing a benefit for an advertising campaign – something like Safe in Sonora. I don’t recommend hanging out after dark in a border town (especially Ciudad Juarez – home to 7,000 out of the 30,000 deaths in the past four years), but south of the border, if you mind your P’s and Q’s, you are probably as safe as you would be in any large city. COME TO MEXICO! DON’T LET THE DRUG RUNNERS HAVE THE UPPER HAND! Related to this particular blog is the news that the one billion dollars paid by Homeland Security to Boeing was money down the drain. The invisible, virtual, high-tech fence (think cameras, radar, and vibration sensors) has failed to deliver. The 53 miles of “fence” has been installed along the 2,000 mile border; unfortunately, the fence is too sensitive – even a tumbleweed sets it off. Did I mention that we come for the three-mile empty beach, birds, diving, dolphins and kayaking? Check this out. Incredible! Im green with envy! Next stop – Mexico!! !